In keeping with the on-going needs for flexibility and combined options for long-term care (LTC), Chester Village provides all of the modern requirements necessary to address comprehensive security, nursing and social support for all residents. Our beautiful, spacious central lobby has a gift shop, a cafe, a barber/beauty salon, and a Client Service Centre with banking and postal services. This Town Square design provides all residents ample opportunity to participate actively in the life of the home or simply sit and watch the daily comings and goings. Since meals are often the highlights of the day, the dining areas on each floor are open, and comfortable spaces where the nursing staff help residents to feel they belong in this important social aspect of residence life. All of these areas have both north and south views. There are 7 distinct 29 bed Resident Home Areas (RHAs), on the 4 floors and each of the second, third and fourth floors has a spacious, secure, plexiglass-enclosed balcony overlooking the garden and outdoor areas. 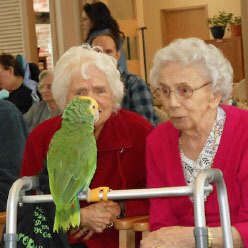 Residents can choose to relax and enjoy the view or participate in organized activities. 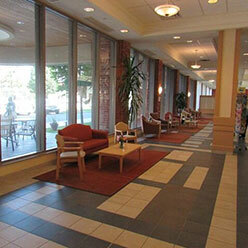 From the ground floor there is easy access to all-important green space for all residents. Our secure, enclosed Enchanted Garden is a quiet oasis on the south side with shaded seating areas, level walkways, flowers and elevated planters for residents in wheelchairs. Our Shared Accommodation rooms can be adapted into deluxe suites for couples, with one room being the bedroom and the other becoming the sitting room. 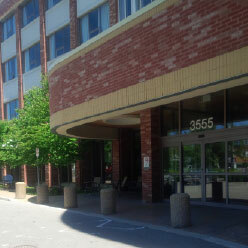 The Chester Village building utilizes a modern curved design with open concepts, and the use of light from large windows adds to the spacious and homelike feeling. Most resident rooms are enhanced with eleven-foot vaulted ceilings complimented with crown moldings while the entrance areas and bathrooms have dropped ceilings. All resident room bathrooms are fitted with handicap assists. All rooms are attended daily by our homemakers to keep everything clean and tidy. Personal laundry is completed at our on-site laundry. Ample free parking for our visitors is available in our large parking lot. TTC access is available through subway and bus connections. There is a bus stop in front of our home.